Source: Addis Prepares for a protest rally joining nationwide uprising that calls for an end to tyranny | ESAT Residents of Addis Ababa will take to the streets on Sunday calling for the end of the tyrannical regime joining the nationwide uprising in all directions of the country despite brutal and deadly crackdown by TPLF regime forces. 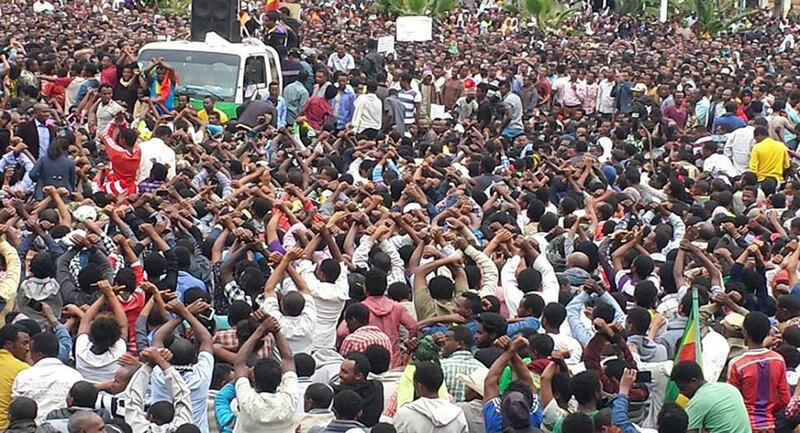 Organizers and activists who spoke to ESAT said residents of the capital Addis Ababa were ready to show solidarity on Sunday with the people of Amhara and Oromo who have been bearing the brunt of the fight against the brutal regime whose forces have been shooting live bullets at protesters. Disturbing videos of killings of protesters have been shared over the social media especially in the last few days showing TPLF forces shooting at close range at protesters killing several people. Over one hundred people were killed in just one weekend alone in Gondar and Bahir Dar while killings have been reported almost on a daily basis in the Oromo region where protests have been going on for nine months now. A visitor to Addis Ababa who is on vacation in his hometown told this reporter on the phone that there have been a heavy presence of security and soldiers on pick-up trucks on every corner in the city. Activists told ESAT that red cards have been produced for distribution and everyone will carry one on the day of the protest. The showing of the red card has a strong significance in this soccer crazy capital with diehard fans of local and international soccer teams. The residents of Addis will hold the thousands of red cards high in the air to unequivocally send a message to the despotic regime that it is “out.” “People had enough already and they want the brutal regime to go,” a resident told ESAT on the phone on Thursday. In Gondar, residents will be clad in white attires for a rally on Saturday in memory of those killed by TPLF security forces. Organizers said white attires were chosen to stand in contrast to regime cadres who will come out commemorate the death of Meles Zenawi, the tyrant who was the mastermind of ethnic divisions and animosity among the people which they have now rejected as they show solidarity to one another rejecting the minority rule. Residents of Gondar have just concluded a three day stay at home protest shutting down government offices, businesses and transportation. In Robe, Bale, Oromo region security forces on Wednesday shot indiscriminately at the thousands of protesters killing at least one (pictured). Video shared on the social media show security forces shooting at protesters who were peacefully marching down a street. In Amba Giorgis, Gondar, residents of the town held protest rally on Thursday that was concluded with freeing 14 prisoners from the town’s jail. The prisoners were detained by the regime’s security in the recent protest held in the town. Meanwhile, officials of the ruling EPRDF have been holding meetings with government employees at various levels begging for their collaboration to thwart any uprising. ESAT got hold of a document prepared for the meeting that accused Patriotic Ginbot 7, an armed opposition based in Eritrea, OLF and the Eritrean government of orchestrating and directing the ongoing uprising in the Amhara and Oromo regions.